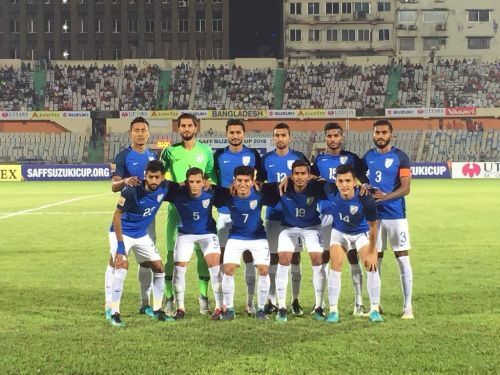 The Indian national football team faced familiar opposition in the final of the SAFF Championship 2018 when they took on the Maldives side at the Bangabandhu National Stadium in Dhaka, Bangladesh. The Blue Tigers have been undefeated throughout the tournament and were in high spirits going into the match, after a convincing 3-1 victory over fierce rivals Pakistan in the semifinals a couple of days ago. The match started on a poor note for India as they went down a goal in the nineteenth minute despite dominating proceedings on the pitch. The first half ended 1-0 for the Maldives and India began the second half with confidence. However, a momentary lapse in the communication led to the second goal for the Maldives. Sumeet Passi scored at the death to spark hopes of a late comeback but it proved to be too little, too late for India. Maldives held on to their lead and clinched the SAFF Championship for just the second time in their history (first win in 2008) denying India a chance to defend their title and win it for the eight time. Vishal Kaith (5/10) - The Indian goalkeeper had a quiet first half until the moment the Indian defence was caught with a goal by Hussain in the 19th minute. He ended up conceding another goal in the second half. Davinder Singh (5/10) - The young right-back had a tough time on the pitch tonight dealing with the attacking threat on his flank. As a result of this, he did not provide attacking support like he usually does and was subbed off at the start of the second half. Salam Ranjan Singh (5.5/10) - The East Bengal man used his physicality well inside the box to deal with the Maldivian attackers. He was always a threat from set pieces and had a couple of chances from corners. Sarthak Golui (5.5/10) - The man with the powerful arm was used again for his long throw-ins by the Indian side. He was strong with his tackling and won a lot of headers at the back. Subhashish Bose (6/10) - The Indian captain was heavily involved in the attacking side of things as he made a lot of runs down the flank, but was good tracking back to defend as well. Vinit Rai (6/10) - The defensive midfielder played just in front of the defence for India and made a lot of interception in between as the Maldives were active in midfield. Anirudh Thapa (6.5/10) - The central midfielder was highly active in the middle of the park as he was the major playmaker for the Indian side. He was also deployed on set-piece duty and put in a lot of balls into the box for the attackers. Nikhil Poojary (6.5/10) - The winger played primarily on the right flank today and had a good attacking outing making darting runs down the line. He put in a lot of crosses for the attackers inside the box and used his pace well. Ashique Kuruniyan (6.5/10) - The young man from Kerala did well on the wings with his speed troubling the Maldivian defence. He combined well with the midfielders to create chances for the attackers. Farukh Choudhary (6/10) - The striker played up front alongside Manvir Singh and kept making good runs into the box, but did not have many chances on the Maldives goal. He was replaced in the second half by Sumeet Passi. Manvir Singh (6/10) - The star of the semifinals win over Pakistan had a subdued night tonight in the attack as he was heavily marked inside the box. He did have some chances on the goal but they were saved well by the Maldives keeper Faisal. Germanpreet Singh (3/10) - Germanpreet Singh was put on by Stephen Constantine at the start of the second half replacing Davinder Singh at right back position. Sumeet Passi (5/10) - The goalscorer from the semifinal against Pakistan was put on for the last twenty-five minutes to boost the attack as India looked for the elusive goal. He made his chance count scoring from close distance in the 92nd minute sparking hopes of a late comeback. Hitesh Sharma (2/10) - The ATK man Hitesh Sharma was put on for the final twenty minutes as he replaced Thapa in the midfield. Indian Football Round-up: AIFF spends 2018 misleading fans, what does 2019 hold for Indian football?